Gullfoss means translated "Golden Falls" and is one of Iceland's most beautiful and without a doubt Iceland's most popular waterfall. The waterfall Gullfoss © Tobias Klose, Scuba Diving in Iceland Glacial water is brownish, since it carries lots of sediments that the glacial ice has carved off the earth. Gullfoss is called the "Golden Falls", since on a sunny day the water plunging down the three step staircase and then tumbeling in two steps down into the 32 m deep crevice truly looks golden. To stand at Gullfoss and wallow in the beauty and the wonder of nature is an uplifting experience. One feels more energetic when leaving Gullfoss than when arriving. 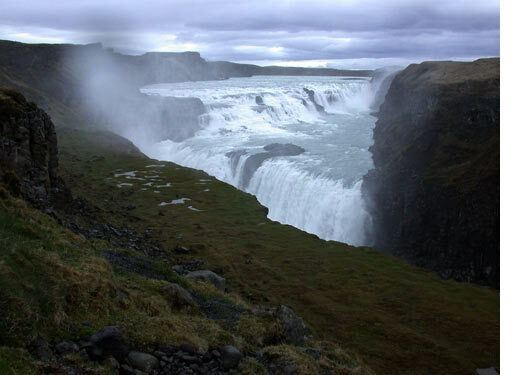 That's the impact these unique nature sites such as Gullfoss and Geysir have on us. As the story goes it's thanks to Sigríður Tómasdóttir that we still can uplift ourself with the beauty of Gullfoss, because she was the one that protested so intensly against these plans by going as far to threat that she would throw herself into Gullfoss and therby kill herself. To make her threat believeable she went barefoot on a protest march from Gullfoss to Reykjavik. In those days the roads weren't paved and when she arrived after 120 kilometers her feet were bleeding and she was in very bad shape. The people believed her and listened and the powerplant at Gullfoss was never built. Today one can see the memorial site of Sigríður that decipts her profile at the top of the falls.